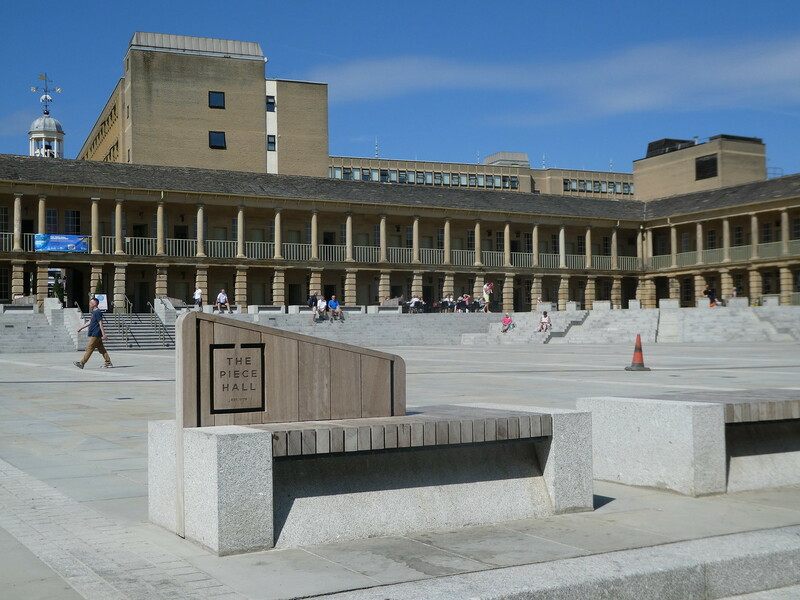 It was a long time since I last visited Halifax and hearing about the re-opening of its Piece Hall, I decided to take a look. 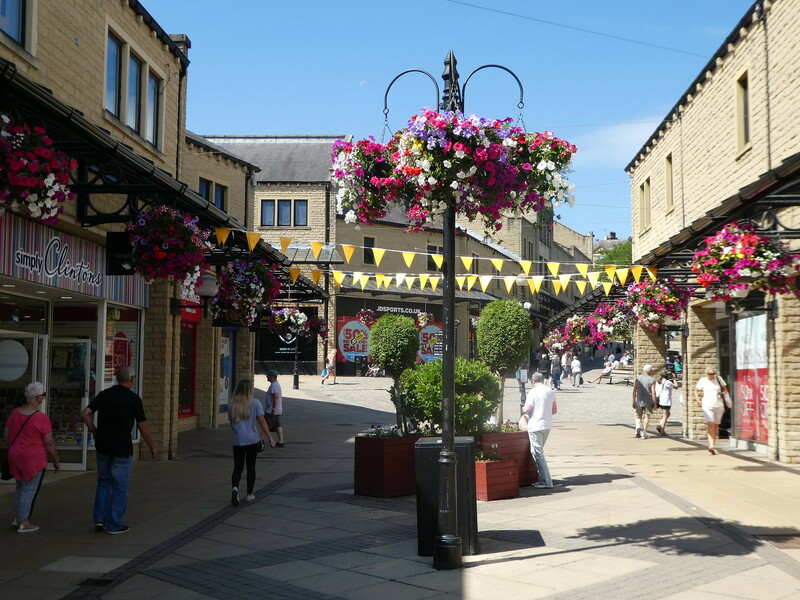 The town is located in the South Pennines of West Yorkshire, four miles from the M62 motorway. It’s easily accessible by train, my preferred mode of transport, and lies on the Calderdale Line with connections to York, Leeds and Manchester. 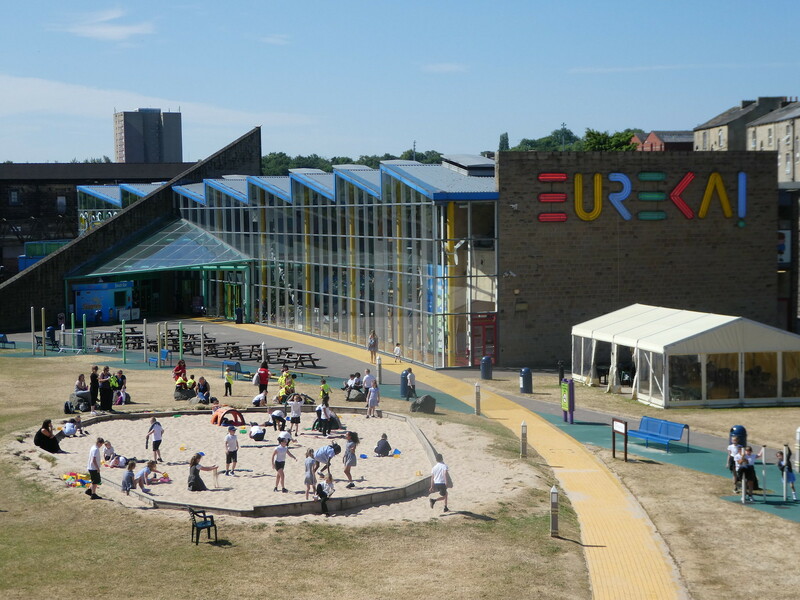 Leaving the railway station, I spotted Eureka, the National Children’s Museum which was inspired by Prince Charles in 1992. I remember taking my own children there when they were small where they enjoyed all the hands-on activities. It’s probably the only other time I’ve been to Halifax and the first time I’ve had a proper look around. Halifax was a centre of woollen and carpet manufacturing from the 15th century with pieces of cloth being traded at the Piece Hall each Saturday for almost 250 years. 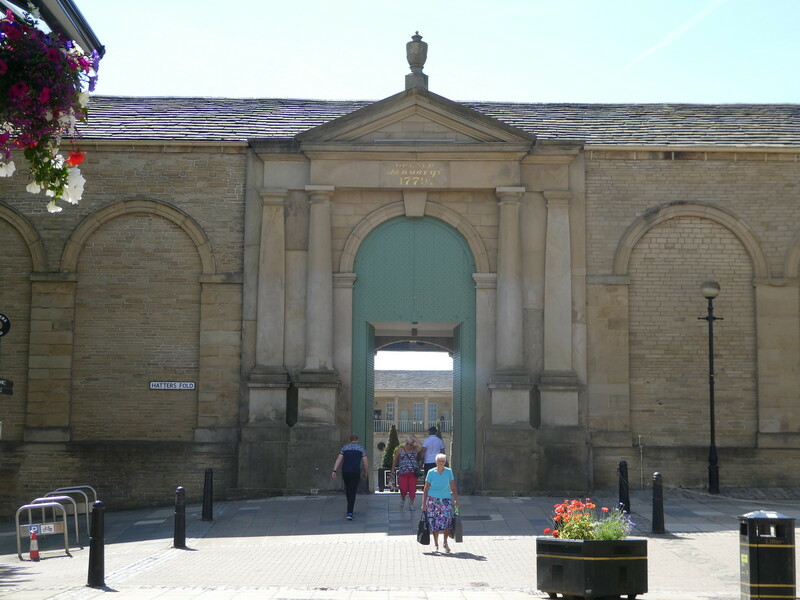 I’d read that the Piece Hall had undergone a three year £19 million conservation and transformation programme partly funded by the Heritage Lottery Fund. It re-opened on 1st August 2017 (Yorkshire Day) and has received numerous prestigious awards. 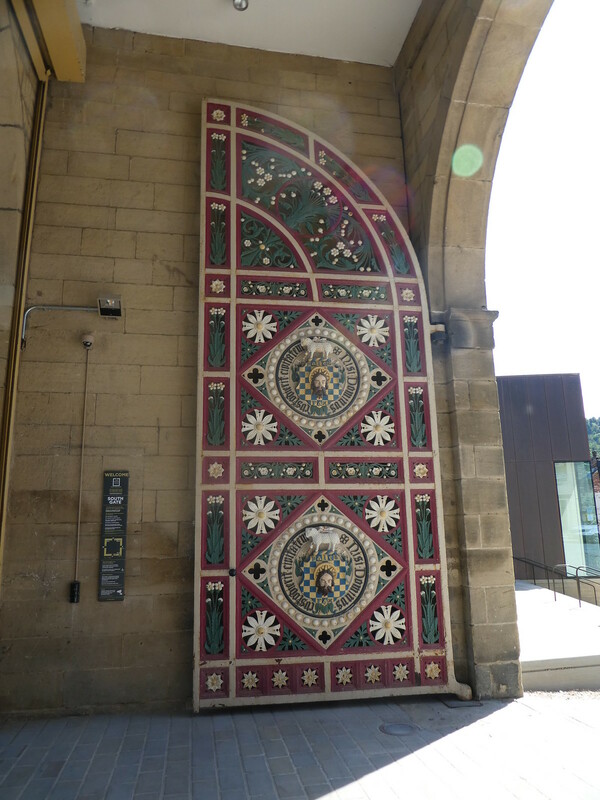 I entered the Piece Hall through its magnificent south gates which have been repaired and restored to their original condition and decorative scene. The gates were made in Glasgow in 1871 with a wrought iron framework bearing cast iron panels depicting John the Baptist. The gates lead to a vast square with Georgian buildings on each side fronted by interior colonnades leading to 315 separate rooms where cloth was traded. This Grade 1 listed building is a sole survivor of the great 18th century cloth halls, dominating the trade in hand woven textiles. It dates from 1779 when it was built for the trading of ‘pieces’ of cloth, a 30 yard length of woven woollen fabric produced on a handloom. 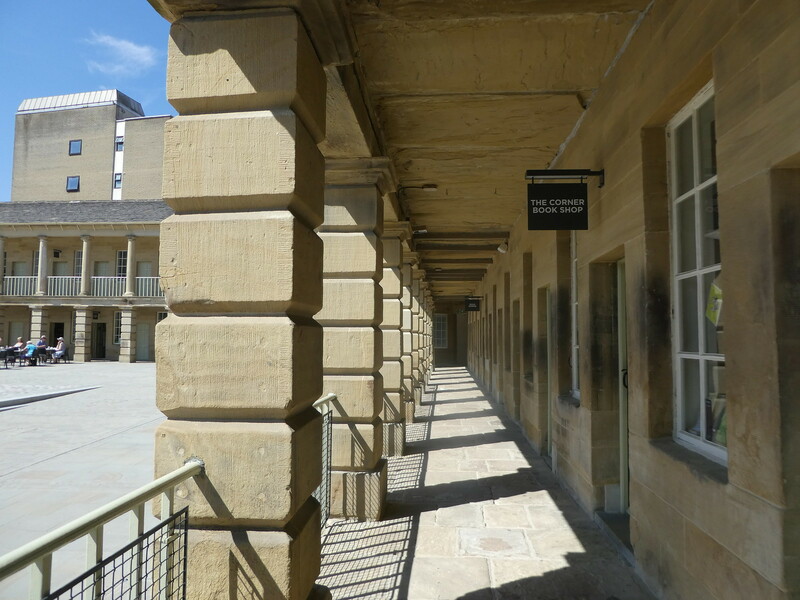 The Piece Hall was a stunning combination of commerce and culture and since its restoration it is again a centre for business, arts and people. Some of the heritage spaces are now occupied by local artisans, galleries and independent, specialist retailers. 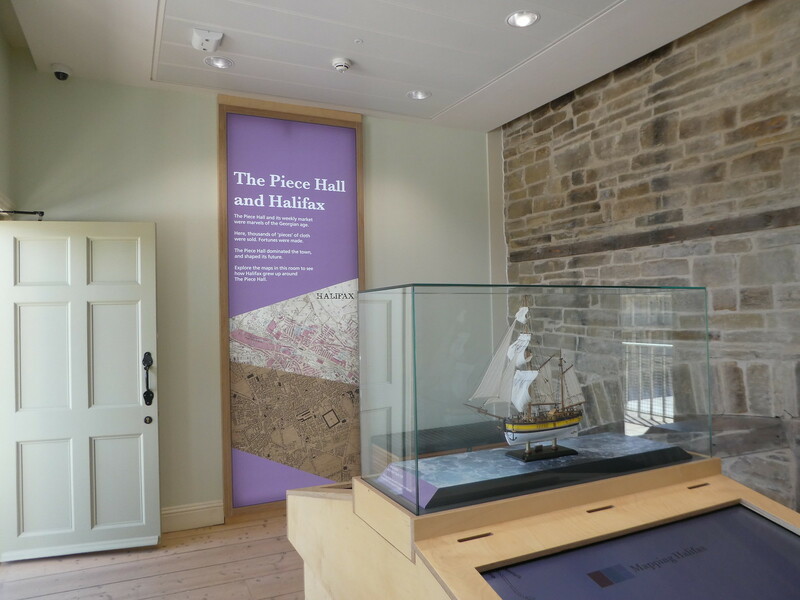 Three heritage spaces tell the story of the Piece Hall. The first one we visited was the ‘Piece Hall Story’ which is an interactive heritage space about the significance of the Hall where visitors can even try on Georgian costumes. Next, I explored the Map Room which has interactive maps demonstrating how woollen cloth sold in Halifax was traded across the world. The third heritage space was called the Trader’s Room and this was set out in its original condition so that we were able to visualise the sights and sounds of what it would have been like to be standing inside the Hall on a busy trading day in 1779. Continuing, I made my way back down the stone steps to the square where I found several cafes, a new Library and the Calderdale Industrial Museum creating a cultural quarter in this part of town. 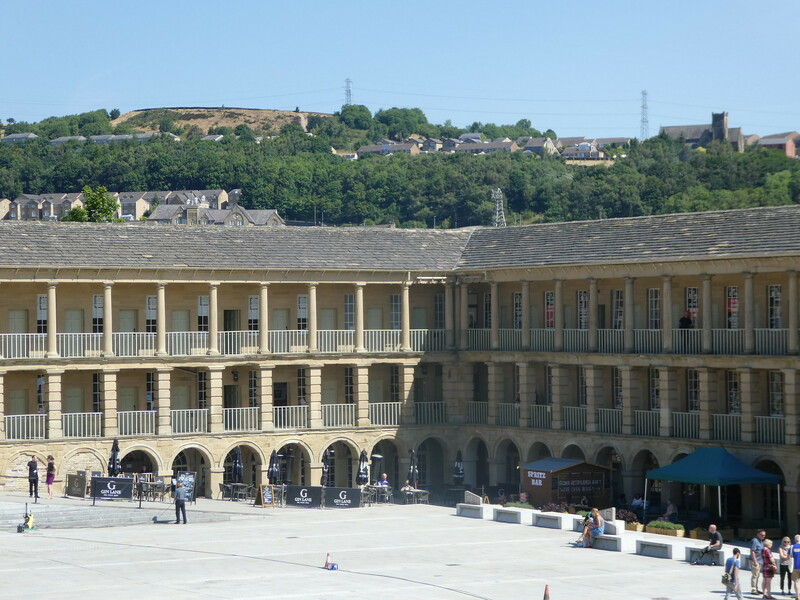 The Piece Hall plaza now hosts a vast array of events ranging from classical music to street performers. The north gate leads out to the Woolshops Shopping Centre which is comprised of a pedestrianised zone lined with shops. This area was very welcoming with its many hanging baskets and flower pots brimming with petunias, geraniums and other assorted annuals. As I continued slightly uphill I found pleasant wide shopping streets with flowers everywhere. Noticing a covered archway, I wandered through the ornate Victorian arcade to the Borough Market. This beautiful glass and wrought iron covered market place was built between 1891-1896 and still flourishes today with over 100 market stalls operating six days a week selling fresh produce and household goods. 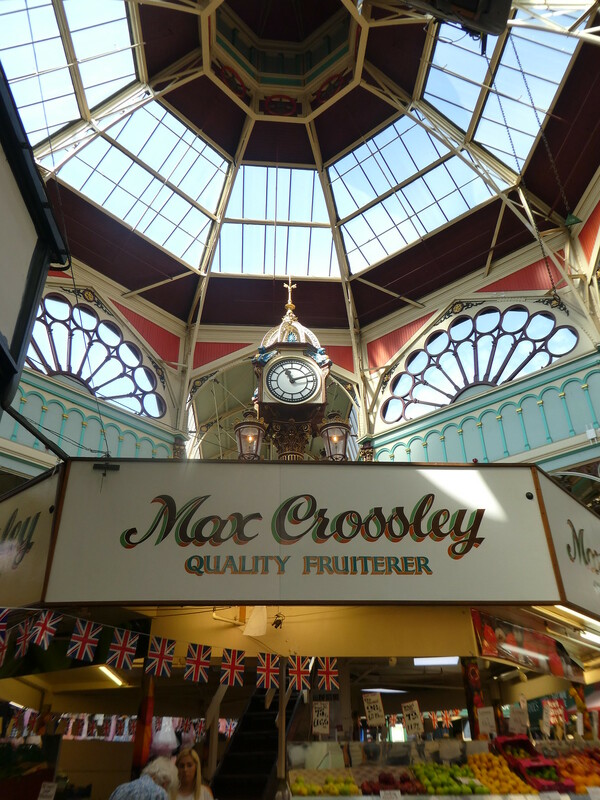 Suspended from the roof in the centre of the market hall is a 60ft (18 metre) high octagonal lantern which is supported by cast iron columns. Hanging below the lantern is a decorative clock which is visible from most parts of the hall. 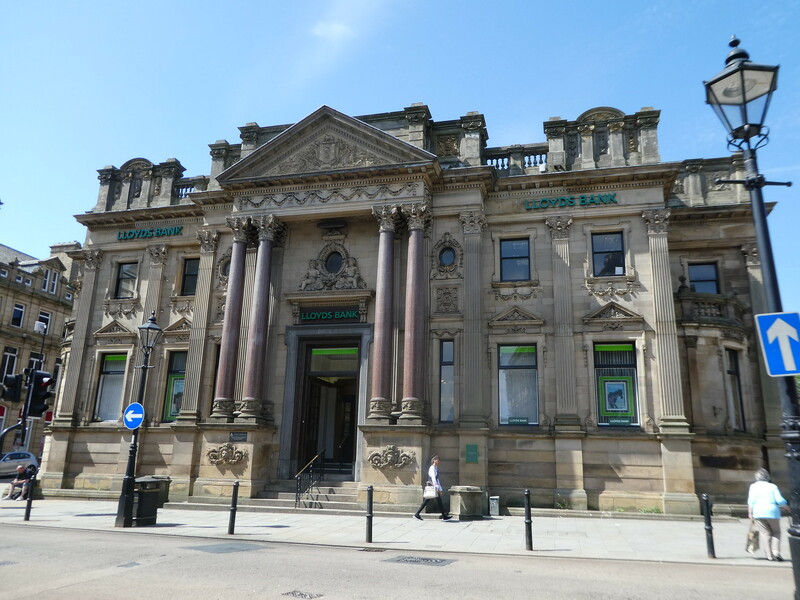 On leaving the market I slowly made my way to the top of the town as I wished to take a look at the former headquarters of the Halifax Building Society which originated in the town and is now the offices of Lloyds Banking Group. Near there, I came across Harvey’s, an upmarket independent store where I spent some time enjoying looking around and having a light lunch. Retracing my steps back down towards the station I just had one more place I wished to visit and this was Halifax Minster. 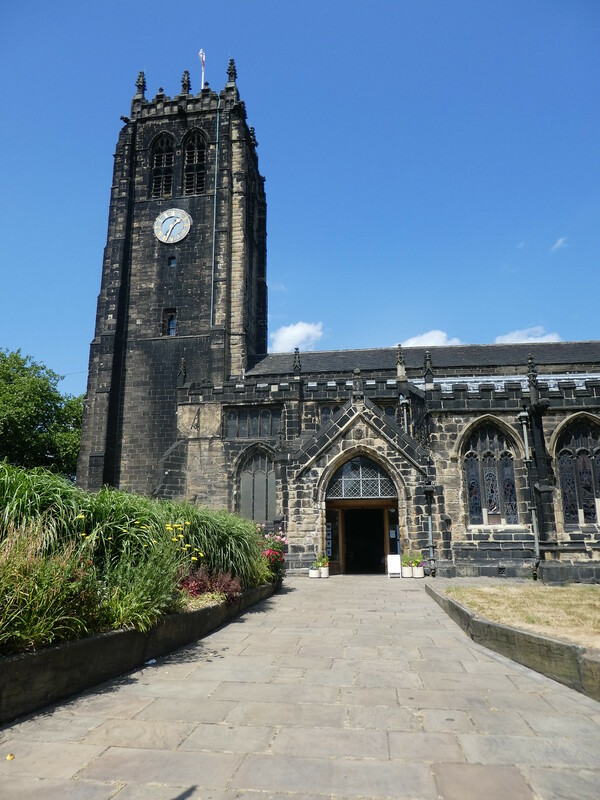 The 15th century church of St. John the Baptist was given minster status in 2009 in recognition of its important role in civic life in the borough. Stepping indoors, the historic interior of the minster is absolutely beautiful with its stained glass and painted wooden ceiling panels. I particularly liked the font which is acknowledged as being one of the finest in England. 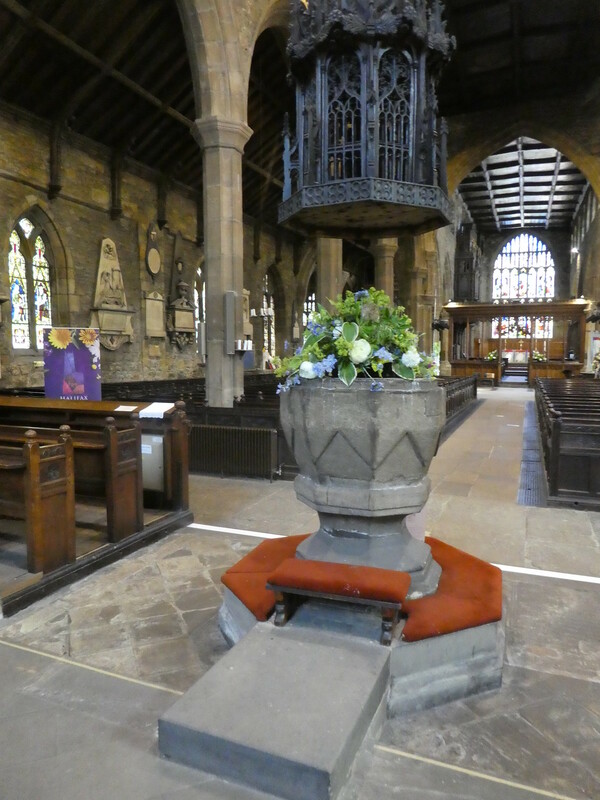 The stone font bowl is thought to date from the 15th century. The Jacobean pews are another prominent feature dating from 1623-1635. Admission to the minster is free but donations towards the upkeep of the church are welcomed. It was then time for me to return to the railway station and make my way home. I very much enjoyed my wander around Halifax and hope to return before too long to see more of what the town has to offer. Thanks so much for this visit to and tour of Halifax. I was both pleased and surprised to discover that Piece was the correct spelling. New information often throws a light on old ignorance. I’ll be back for a longer visit, more travel, and light. I thought this was the Halifax in Canada. Haha. Sorry to disappoint you but hope you enjoyed reading about the U.K. Halifax anyway! Glad you enjoyed it, thanks for your comments. I love the little streets with flowers in hanging baskets too Marion. So sweet. Thanks Sue, Halifax has really made a big effort to make its town attractive and the Piece Hall is stunning. Hope your holiday is going well! Thanks M. Two weeks o have been away now. Holiday is going great. Thanks again. When I first read the title, I thought of Halifax, Nova Scotia. Thanks for showing me this interesting place. Halifax, UK is very interesting and it’s Piece Hall exquisite but of course I would also like to visit the Canadian Halifax, too! Beautiful shots! I adore glass topped arcades, perhaps because of the La Scala Arcade in Milan, which I first experienced at Christmas, 1960. Mystical, dark/light, inside/outside. Thank you for your kind words. I also enjoyed visiting the elaborate arcades of Milan. Thank you for your kind words, ira nice to read you enjoyed this post. Absolutely, I did 🙂 You’re very welcome! Looks like a lovely place. Eureka looks fun. Halifax is once again an attractive town and the renovated Piece Hall beautiful. 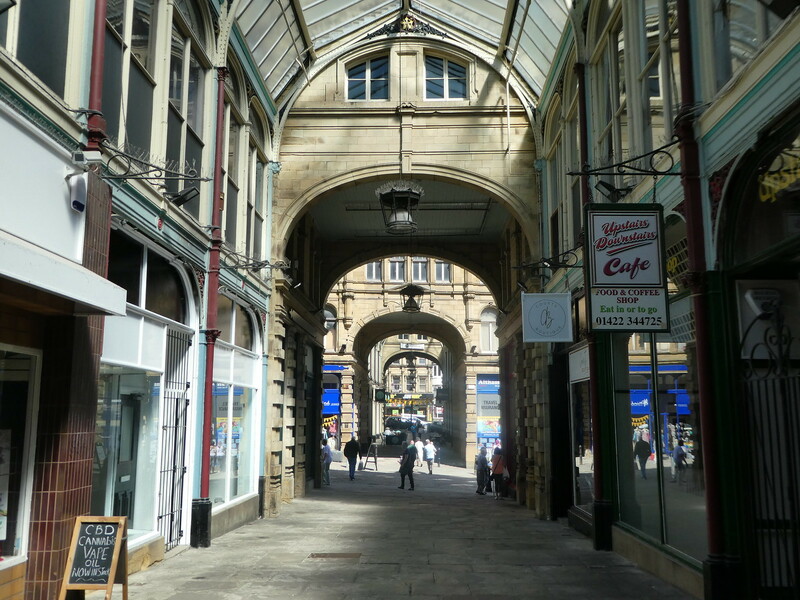 The Piece Hall looks fabulous, Marion, and I love the arcades too. 🙂 🙂 I’ve been meaning to take a certain 5 year old to Eureka for ages. Like you I’ve not been since my son was young. Looks like a return trip might be needed. I was pleasantly surprised to note how attractive Halifax has become Jo. Thank you for your thoughts. Fascinating place. I would have liked to see the trading room. That minster looks like it’s due for a good cleaning! The Piece Hall is both a beautiful and a fascinating building and I agree that the stonework on the Minster is in need of cleaning. I knew of the Piece Hall, of course, being a Yorkshirewoman. I’ve never actually seen it though. My but it’s magnificent! 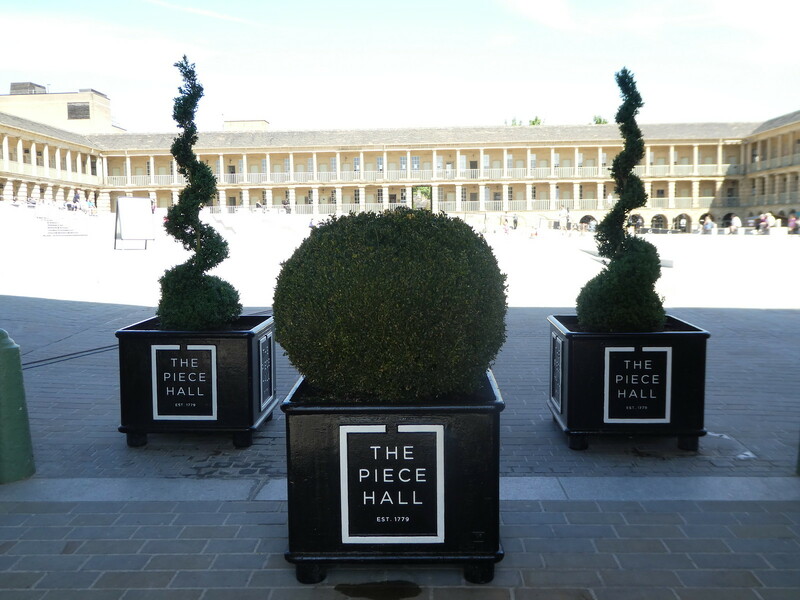 Thank you Stella, the Piece Hall is indeed magnificent and it’s so pleasing that investment has taken place to return it to its earlier grandeur. Great photos! I haven’t been to Halifax for years; it looks a great deal better than it did. The investment was well worth it. Thank you! I was very pleasantly surprised to see Halifax looking so nice! I got excited, I thought you were in my hometown of Halifax, Nova Scotia, Canada 😉 seems like a lovely place all the same. Sorry Natalie for my post bring about the English Halifax. If it’s any consolation, I would really like to visit Halifax, Nova Scotia one day! I’m so glad the UK preserves these old buildings. They were built well and on a grand scale. England exported some of the building design ideas to colonies in the colonial era and in spite of some of them being allowed to deteriorate most are valued and well preserved today. Thank you Ian, the Piece Hall underwent a huge renovation project and as well as preserving this beautiful old building will help to boost tourism in the town. Thank you for your kind comments once again. I’m pleased you enjoyed this post.